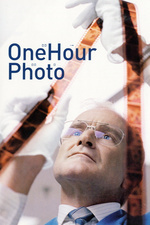 An employee of a one-hour photo lab becomes obsessed with a young suburban family. Robin Williams shows he has acting chops in this role that plays against his zany, light-hearted public personna. Written and directed by Mark Romanek. I suspect that I'm probably not the only one who enjoyed luring unsuspecting people into watching this movie by telling them that it stars Robin Williams. The realization that there isn't some zany comedic punchline coming, and that the first 45 minutes of the movie isn't some weird setup for Mrs Doubtfire-type hijinks, is fantastic. Also, I worked in a photo lab at the time the movie came out and it was followed almost immediately by a new requirement to shred all test prints and accidental duplicates from customer film. The memo sent out by corporate didn't name the movie specifically, but was clearly in response. Sorry I didn't get this up myself, jcifa. Yesterday was a mess. Thank you. I am now thoroughly depressed. I think I'd have been less traumatized if someone had died. Up until Sy started running, I really thought he knew the cops were coming. The husband and Maya are going to need therapy. Extensive. The scene with Sy in their home caught me hook, like, and sinker. Using their bathroom, watching the game. Nice to see Erik LaSalle from ER and Agent Coulson. Coulson has certainly embraced his look. A woman with pubic hair. Now that was shocking. So the bits about Sy always having hep and mono as a kid and the last photo, those were both fake, yes? I'm off to watch something uplifting, maybe a re-watch of TWD or GoT. Using their bathroom, watching the game. Was he actually using the bathroom though? Would it be more weird or less weird if he was actually using the toilet, just sitting there to check out the view. I love this movie, but it invaded my personal space on the level of someone casually putting their hands on my torso while I'm riding the subway. I can't re-watch right now but I'm positive his pants were down and I saw bare thighs when he was in the bathroom. To me, that makes it even more disturbing if he's just sitting there seeing the sights with his pants down to be method stalking. The main thing is that he's a real weird dude and I wouldn't put anything past him. This was the first movie I saw Robin Williams in where I was very impressed by his acting chops. His performance is so controllled and tight: his Juilliard School acting classes are coming through here. A startlingly disturbing performance. Reeve and Williams had a class in dialects taught by Edith Skinner, who, Reeve said, was one of the world's leading voice and speech teachers. Skinner had no idea what to make of Williams, adds Reeve, as Williams could instantly perform in any dialect, including Scottish, Irish, English, Russian, Italian, and many others. Their primary acting teacher was Michael Kahn, who was "equally baffled by this human dynamo," notes Reeve. Williams already had a reputation for being funny, but Kahn sometimes criticized his antics as simple stand-up comedy. In a later production, Williams silenced his critics with his convincing role of an old man in The Night of the Iguana, by Tennessee Williams. "He simply was the old man," observed Reeve. "I was astonished by his work and very grateful that fate had thrown us together." I saw this one in the theater in 2002 and somehow remembered it as a subtle film with a nice score. My wife and I watched it again recently. It's not subtle at all. Still has a great score, still a suspenseful thriller. Robin Williams confidently walked the thin line between playing the character so that the audience felt like they knew him, and being completely, terrifyingly unpredictable.